The Point: RCTC votes unanimously to advance three projects that will relieve congestion on I-15 corridor. The RCTC Commission unanimously voted last week to recommend $100.5 million in state funding for three projects to relieve traffic congestion on the I-15 corridor. Every two years, the California Transportation Commission (CTC) accepts nominations for funding from the State Transportation Improvement Program (STIP). Each county receives a fair share of dollars from the program based on the population of the county. 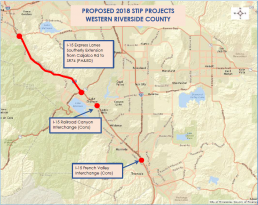 The STIP is an opportunity for Riverside County to set its own priorities for state transportation funds and address unique regional needs, such as congestion throughout the I-15 corridor. 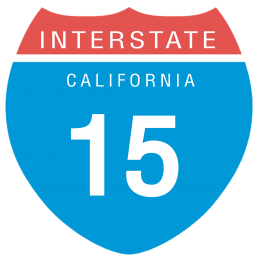 New funding for these I-15 corridor projects is possible due to the recent passage of Senate Bill 1, which makes long-term investments in the state’s transportation system. Extending the I-15 Express Lanes south to Lake Elsinore is a top priority of RCTC. The project will provide more reliable time-saving travel options for drivers and express transit riders who on average have some of the longest commutes in California. In 2011, RCTC partnered with the City of Lake Elsinore to take the lead in upgrading the I-15/Railroad Canyon Interchange, which will significantly improve safety, time savings, and economic growth for Lake Elsinore residents. The I-15/French Valley Parkway Interchange will provide a critical traffic outlet for the city of Temecula and also lead to time savings and quality of life improvements for southwest Riverside County. RCTC will now prepare a formal application for the STIP funds, due in December. The CTC is scheduled to give final approval in March 2018. RCTC will also nominate STIP funding for the Coachella Valley. The Coachella Valley Association of Governments (CVAG) will make funding recommendations to RCTC on September 25 for how the desert region’s $22.7 million share of STIP funds should be allocated.